3 distinct fast-charging technologies ensure that any and all devices are charged in the shortest time possible. Never worry again about having no time to charge. PowerCore 20000 packs almost seven iPhone 7 charges or five Galaxy S8 charges into your bag or pocket. That's a whole week of charging without needing to plug into the wall. The Speed series uses exclusive technology developed by Anker engineers to control its temperature when charging. If high temperatures are detected then it automatically modifies power output to reduce heat. Surge protection, short circuit prevention, temperature control, and premium LG battery cells keep you and your devices safe. Will not provide a high-speed charge for Asus ZenFone 3. Not compatible with devices with an input below 50mA (e.g. some Bluetooth headsets and GPS devices). 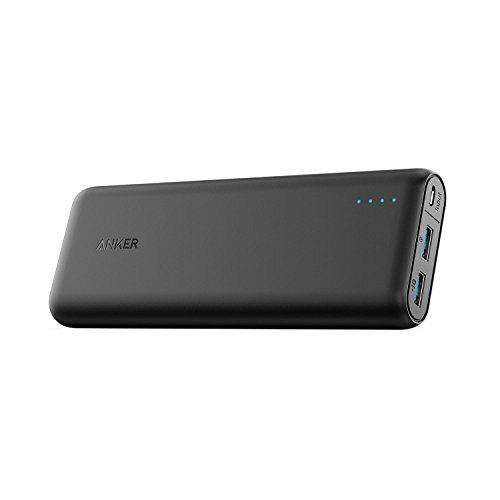 Charge Faster: Qualcomm Quick Charge 3.0 (24W) with Anker's proprietary PowerIQ and VoltageBoost technology deliver the fastest possible charge to almost any USB device.